Office - beside the whole Windows Operating Systems series - is probably the widest-known product of the Redmond Giant studios. Microsoft Office suite - dependently on license version - is compounded of a few elements: Word, Excel, PowerPoint, OneNote, Outlook, Publisher, SharePoint, and Access. Successive versions of the suite differed slightly, but the newest, 2007 release had to be a breakthrough. At least, in the matter of design. The whole interface has been rebuilt to follow design changes applied in Windows Vista OS, that has been released at a time. Newly-made toolbar have had to simplify an access to the most important options. Whether it really works, remains questionable. One thing is there for sure - the interface of the new Office demands getting used to. The whole Office suite has grown its popularity as a best set of tools supporting everyday tasks by majority of users. For the business intelligence use, Office provides twofold components - Excel, and SharePoint. First of them, Excel 2007 has got significantly improved functionality over the previous versions. That results in facilitated data connectivity, and easier and more advanced data sorting and filtering. Finally, an optimized pivot table engine and new chart features has been provided that enables better row and column capacity. As distinct from Excel 2007, Excel Services is a component included in SharePoint Server 2007. Excel Services has been thought to increase data security, which lacks standard Excel has been many times accused of. With Excel Services, central storing, managing, and - finally - securing data capabilities have got significantly improved. Microsoft SharePoint Server is more complex. The newest, 2007, version provides a few improvements designed to help convert the tool into an independent business intelligence portal or BI dashboard. Therefore, the cooperation capabilities have got strongly supported, so that other documents and content might be easily and unproblematically displayed as the dashboard components. Also, across all these components, common filters are prepared to be applied. In addition, Microsoft has included a template BI portal, providing general Report Center, Reports for Me (personal reporting tool), and Today's Reports. 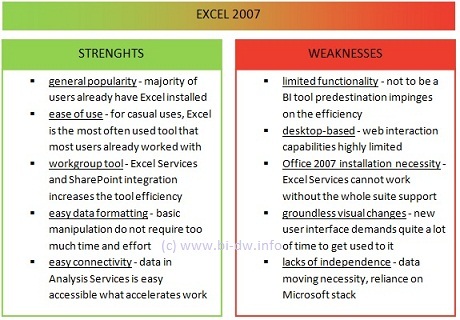 Microsoft states that Excel 2007 has got enough capabilities to function as an independent BI client. Improved charting, data manipulating, and data access options might have been steps bringing Excel closer to the new tasks. Then, SharePoint 2007 provides a capability of using it for creating BI dashboards. Especially because of its Web parts supporting live Excel spreadsheets, Reporting Services reports or other components from Microsoft Office suite, sharing common filters. These improved capabilities caused that Microsoft SharePoint became a competitor strong enough to fight against Business Objects InfoView, Dashboard Manager, Crystal Reports, WebIntelligence and Xcelsius. HOW IS EXCEL CONFRONTED BY BUSINESS OBJECTS? Business Objects solutions seem complementary to the Microsoft Office 2007 suite. Therefore, these two differentiated platforms might work together as BusinessObjects XI provides advanced capabilities that could be presented in Office 2007 dashboard. BO puts some new quality in business intelligence, offering diversified user styles provided on one, single platform. What's worth noticing, BusinessObjects XI works equally well over the web, as with Office components. Describing SAP BusinessObjects XI should be started with one thing - a feature best characterizing the idea of a platform. BO might work independently, but also allows to meet the both sides' requirements - BO enables presenting Business Objects capabilities in Microsoft Office environment. What does it effect in? Dry Excel data might be easy transformed and presented in an interactive way. Accurate, live data might be displayed as Microsoft Office files - Word documents, Excel spreadsheets, and PowerPoint presentations. Business Objects reporting capabilities might be accessible through SharePoint. Analysis Services might be used for analyzing OLAP data. BusinessObjects XI might be integrated into any .NET application. Any reports from Microsoft Dynamics GP, Microsoft Dynamics SL, and Microsoft CRM might be virtually created. And - what's quite funny - BusinessObjects XI doesn't even demand using 2007 Office release. It works perfectly with older versions, as well. But how is the independent work of BO? Not worse. All the capabilities might be easy and quickly accessible through the web browsers. That doesn't matter if you are going to only view the data, or transform it someway, everything you can reach just over the web. BO provides all the advanced capabilities that might be required, but casual workers looking for simple information will find it, too. Easy and intuitive web interface facilitates their work. BusinessObjects XI meets not only casual workers needs, but also supports everything that professional analysts require - all the queries, analysis, and reporting are quickly accessible. BusinessObjects independence results in timely delivered innovations and upgrades - there's no necessity to wait for the whole Office suite new release. Single business intelligence platform helps reducing costs of implementation and further maintenance. Using only a single platform, BusinessObjects XI provides an unrestricted access to all kinds of data - independently on their OLAP cubes, SQL Server, and other character. BO brings a new security control quality replacing former only twofold "view-only", and "access-all" capabilities. Differentiated business intelligence styles no longer demand different platforms - BO provides them all on a single solution. The "all-in-one" capability lets Business Objects XI support diversified environments, independently if they're Microsoft, non-Microsoft, mixed, and the devil knows what more. A single-platform solution results not only in costs reduction, but also in an improved data timeliness and quality. Integrated data is trust-worthy and helps making better decisions based on best information. Always known data origin makes that there's no orphan-cases interfering the overview. Intensified worry on accuracy, consistence, and complexity ensures that delivered data is always top-quality. Finally, the real-time disparate data integration not demanding IT interventions applies to successive time reductions. Finally, one more thing should be mentioned - price. A customer, purchasing Office 2007 - dependently on version - has to be prepared for paying about $500. Whether he prefers only an upgrade, that's approximately $300. In practice, prices are much more diversified. Office suite might be bought in about eight versions, beginning with Basic, through Standard, and Small Business, up to Enterprise license. Also, the costs of SharePoint Server 2007 implementing are significant - that means about $7,000 for server instance, and further $140 per user. When we talk about Business Objects, the more competetive might be purchasing a Business Objects XI Edge licenses which is a pack of named 10 users with access to InfoView, WebIntelligence, XCelsius, LiveOffice and Crystal Reports. BO Edge 10-users pack costs about $10,000-$12,000. Both - Office and Business Objects - solutions have their advantages and disadvantages. Both might be strongly recommended, but the final choice always depends on a customer requirements. All in all, the first thing a customer should start from, is accurate specifying his and his co-workers needs. Before having it done, thinking about choosing best business platform - according to their similarity - is completely pointless.